Client Challenge | The PACTS (Portland Area Comprehensive Transportation System) region extends from the ocean inland to the lakes region, and from Maine’s most populated city to small farm towns bisected by rivers, lakes, marshes, and wetlands. An incredibly broad range of socioeconomic patterns and transportation modes exist within the region. PACTS members wanted a strategic plan that would identify spending goals, align transportation and land use, leverage transportation dollars to attract economic, placemaking, and infrastructure resiliency investments, and help prepare for changing technology and preferences related to mobility. Team Approach | Lead by the Portland Area Transportation System and Principle, Destination 2040 sets a new policy direction for eighteen communities, seven public transportation providers, as well as public and private transportation organizations and citizens. As one of the most densely populated areas of the state, the PACTS region is often times at the forefront of new policy directions, making this plan of statewide importance. 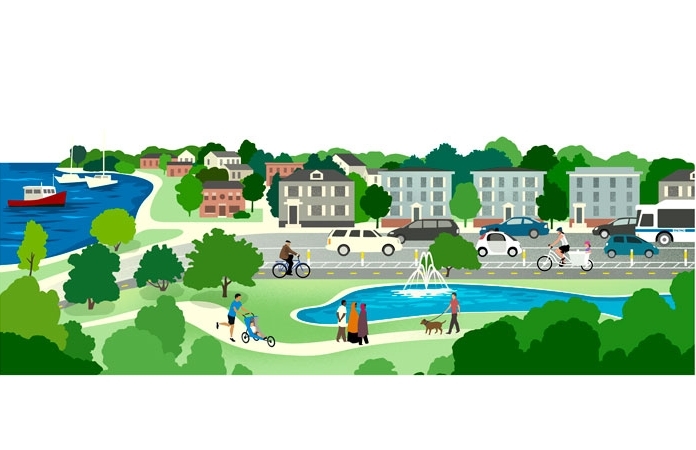 The Destination 2040 plan took three years to develop with the involvement of hundreds of people in over over sixty meetings, plus online feedback. The planners worked closely with stakeholders in communities across the region to identify priority centers and corridors with critical buy-in for the plan. Project Impact | Destination 2040 advances several important ideas that are on the front end of national transportation best practices. The plan identifies 6 goals: Maintain a Regional Focus Support Economic Development Prioritize Mobility, Safety & Accessibility Incorporate Energy Conservation Integrate Land Use Protect Environmental Quality. The PACTS long-range plan includes a strong and intentional connection between land use and transportation planning, and then goes one step further to ensure that transportation funding criteria prioritizes projects within these priority areas, identified as centers and connecting corridors. In addition, the Plan is notable for its effort to distill a technical 200-page transportation plan into a 67-page magazine that can be read and understood by the general population. Typically these plans are drafted as technical planning documents that are used primarily by transportation professionals and others who are setting regional policy. We distilled and packaged the report for a large audience: initially 300 copies were printed, with another 300 printed to meet demand.